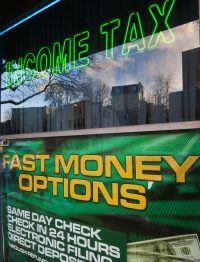 New Orleans Refund anticipation loans or RALs, as they were known, were one of the most predatory products on the market in their heyday targeted solely to low-and-moderate income workers who were most desperate for their tax returns. They were on the other side of the digital divide so less likely to file with the IRS electronically. The money was theirs, and tax preparers, especially the big boys of the market, H&R Block, Jackson & Hewitt, and Liberty Tax Services all exploited this desperation. This was a 21st century national campaign for ACORN, and we forced the first negotiations with H&R Block after 330 actions in a 6 week time period during the height of the tax season, and eventually ended up with agreements with all three of the companies to wind down RALs. Disclosures of the interest rates were part all of the agreements, but it didn’t really matter since even if it said the interest rate on the loan to get their money one week earlier than the IRS would deliver it would cost them 349%, displayed in a poster or on the computer screen, if you have to have the money to pay rent or buy groceries or fix the car and you have to have it right now, disclosures, no matter how predatory don’t matter. Eventually we got HSBC to withdraw as the primary lender to the companies for RALs for what they termed, “reputational reasons” because the loans were so exploitative. Finally, the IRS and eventually other government agencies jumped in and also condemned RALs, and they finally faded from the market. On their website the IRS claimed they were concerned about an “error rate” of between 20 and 27% for filers in order to justify these delays. Something is fishy here. This is the IRS. The error rate should be an exact number based on information they have at hand on how many corrected filings they required, so giving a fudged number raises questions in my mind. Furthermore, their advice is to preparers who enable incorrect filings, which the IRS concedes are largely based on the complexity and confusion involved in the EITC program. Why was the pain not pushed to the preparers, rather than the families filing who were delayed unreasonably in receiving their returns? Oh, and meanwhile the number of audits of higher income filers is in the dumps now! The preparers saw an opportunity and seized it by offering RALs again. Admittedly, these were no-interest loans this time offered against the amount of the return, and they had loan limits depending on the company’s policies. The big boys report over 1.5 million RALs are reported already this tax season with a month to go. Block did 840,000, Liberty175,000, and Jackson Hewitt 485,000. For the preparers, this is just the cost of customer acquisition, since it is cheese in the trap to catch low-income workers who would be forced to fork over the preparation cost to get their refunds. No matter how much sugar you put in the coffee, this is once again the IRS partnering with private preparers to expand their businesses. The only real question is how long it will be before RALs are back in full and terrible force again? The only good news in this tawdry story is that overall filings are down so far this year, so some people at least have decided to wait all of the vultures out.